This Master, named “diplôme d’Ingénieur Civil des Mines (ICM)” in French, is the signature diploma of three French elite Schools of Engineering, Mines Paris-Tech, Mines Saint-Étienne, and Mines Nancy. 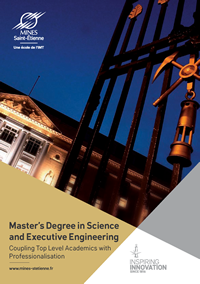 The aim of the ‘Ingénieur Civil des Mines’ Master’s degree in Engineering is to train executive engineers for top-level management and technical positions in industrial and service companies in a globalized context. Based on their academic credentials, international students can be enrolled for the ICM diploma (see admission requirements). ICM welcomes an increasing number of international students from all over the world: Europe, Asia, Africa, Latin America, and North America. It was originally created to meet the needs for elite executive staff in the French mining industry. Associated with the “Mines” label, a symbol of excellence for nearly 200 years, the ICM curriculum offers a broad educational programme focused on ten different majors. Regularly ranked among the top 15 of the 230 French engineering courses, ICM combines broad theoretical knowledge with hands-on projects, development of management and communication skills through mandatory international experience and practical training through long term interships in partner companies.Teaching in small classes, and close educational supervision are essential features of the programme. Research-oriented projects are offered to students wishing to start a PhD programme after graduation. After graduating from Mines Saint-Étienne, an “Ingénieur Civil des Mines” is able to innovate in a chosen field of expertise, interact with experts in other fields, manage complex organizations and lead teams, operate in a multicultural and global context, respond quickly to professional challenges. Visiting or exchange students: as exchange students for a semester or a year, they will get credits for their studies at MINES Saint Etienne, but will not be eligible for a MINES Saint Etienne’s degree. These credits can be recognised by their institution of origin for graduation. Graduating or full degree students (including Double degrees): as regular students for the programme these international students will follow the same curriculum as local students. They are expected to graduate from MINES Saint Etienne with the Master's degree in Science and Executive Engineering, and can be eligible to their home university’s degree as well under a double-degree agreement. Candidates holding a Bachelor’s degree in Science or Engineering, with a 4 year minimum education at the University (possession of 240 equivalent European credits) can join the programme as first-year students. The graduate course in science and engineering—ICM (Ingénieur Civil des Mines) also welcomes international exchange students from partner universities as visiting/exchange students for one or two academic semesters or for lab internships at graduate level. Bachelor of Science or engineering with honors either equivalent with a minimum 4-year education at the University (possession of 240 equivalent european credits) or admission under the framework of an agreement (contact your office of international relations). If you want to apply as an independent candidate please contact: incoming@emse.fr. The ICM curriculum is a flexible and adaptable two-year program designed to allow students to explore and to achieve their own career aspirations. €2,650 per year for EU students - fee waived in the case of Mines Saint Etienne partners. École des mines has always maintained an intimate relationship with the various economic sectors. As a natural feature, industries and companies are in close interaction with the graduate curriculum. Industrial placement is one of the most characteristic trademark of the engineering training, French style. Industrial placements represent 8 months and are therefore a substantial part of the graduate engineering curriculum. Placements aim at giving students a practical knowledge on how companies operate at various levels: as an assistant engineer (M1), and as a junior engineer (M2). These placements are assessed through both a written report and an oral defense. Discover the job of an engineer in the variety of his functions and by his contexts. Give the possibility of deepening and assessing the relevance of one’s personal project. Apply to an industrial problem the know-how acquired during the school programme. Pursue the training in the written and oral communication by a report and an oral presentation of the technical work. Validate the themes and the methods learned in connection with the choice of specialty. Tackle the engineer duties and share some of his responsibilities. To communicate at an engineer level : technical and global communication both written and oral.